Your world is crumbling at the edges, pressed in on all sides by the savage and pitiless darkness - monsters and other evils that prey upon light and life. Most of your people huddle behind walls, convincing themselves that your civilization will persevere and conquer this land. But you don't have that luxury. There's naught for you in this world save blood and treasure. You've no inheritance, no dowry, no rich uncle, not even a job. You've come to this inn because you have no other options but to make your own fortune in this damned world. And it that means delving into ruins of a long dead civilization and slaying a dragon or two, so be it. At least you'll live it up before the end. And who knows? Maybe you'll carve out a stronghold of light against the vast, weird dark after all. 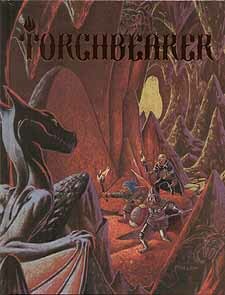 Based on the award-winning Mouse Guard Roleplaying Game, Torchbearer is a riff on the early model of fantasy roleplaying games. In it, you take on the role of a fortune-seeking adventurer. To earn that fortune, you must delve into forlorn ruins, brave terrible monsters and retrieve forgotten treasures. However, make no mistake, this game is not about being a hero or about fighting for what you believe. This game is about exploration and survival. You may become a hero. You might have to fight for your ideals, But to do either of those things, you must prove yourself in the wilds. Because there are no jobs, no inheritance, no other opportunities for your deadbeat adventurers. This life is your only hope to prosper in this world.